Comvita Medihoney Natural Moisturising Lotion is gentle enough for use on sensitive, dry and eczema prone skin. A nourishing all over lotion with oat extract, Medihoney manuka Honey are rich in plant butters to moisturise dry, senstive skin. This body lotion is Natural Products Association certified. Comvita Manuka Honey is sourced from New Zealand`s remote, pollution free native forests. Comvita Manuka Honeys are tested for the unique antibacterial properties which make New Zealand Manuka honey famous. Aqua, Caprylic/Capric Triglyceride, Mel (Honey), Glycerin, Cetearyl Olivate, Sorbitan Olivate, Theobroma Graniflorum (Cupuacu)Seed Butter, Olea Europaea (Olive)Fruit Oil, Cetyl Palmitate, Sorbitan Palmitate, Cera Alba ( Beeswax), Tocopheryl Acetate, Sclerotium Gum, Xanthan Gum, Glucose, Sodium Citrate, Lactoperixidase, Glucose Oxidase, Potassium Sorbate. Apply liberally to dry skin as often as required. Smooth onto skin in the direction of the hair growth. Below are reviews of Comvita Medihoney - Natural Body Lotion - 250ml by bodykind customers. If you have tried this product we'd love to hear what you think so please leave a review. 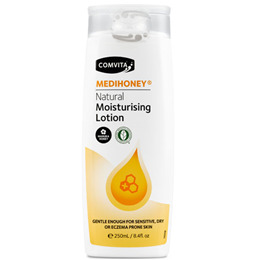 Comvita Medihoney Natural Moisturising Lotion is gentle enough for use on sensitive, dry and eczema prone skin. A nourishing all over lotion with oat extract, Medihoney manuka Honey are rich in plant butters to moisturise dry, senstive skin.